Look up tricky words and keep your place - technology at its finest! A Korean company has come up with an ingenious little reading aid that doubles up as an internet-connected scanner that’ll display online information in real time on tricky words. 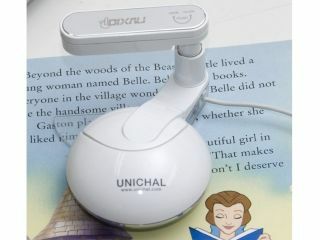 The device is powered by a USB connection and features a reading bar which you position over the sentence you're reading. A small camera scanner is located above this which processes and feeds the words it sees to a selection of user-chosen online dictionaries and reference sites such as Wikipedia. As displayed in an online video, using the Dixau is a simple process: simply line-up the tricky word on the reading bar, click the device and everything you need to know will be displayed on your computer. Unfortunately the company's official website appears to be almost entirely in Korean, so there’s no word on whether the Dixau is available in Europe or North America. There’s also no official word on what languages it’s able to recognise, although from the video it does appear to understand English.